The measurement of PSP was made using the ProComp Infinity™/ BioGraph Infinity (Thought Technology Ltd., Montreal) biofeedback system. The following indices were measured (Table 2). To evaluate the temporary mood states, the Profile of Mood States (POMS) test was administered. The POMS assesses six affective mood dimensions: tension-anxiety (TA), depression-dejection (D), anger-hostility (A), vigor-activity (V), fatigue-inertia (F), and confusion-bewilderment(C). 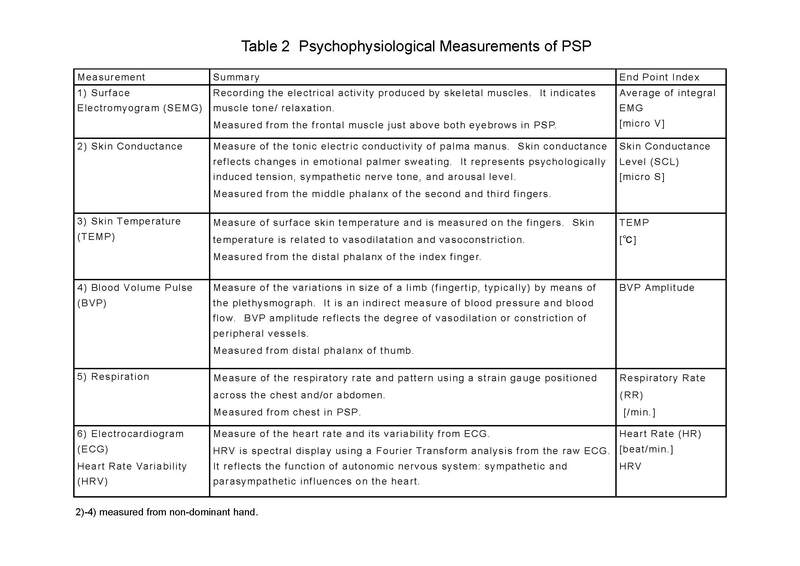 The subjective symptom score (subjective severity of symptoms) and the subjective tension score (subjective feelings of tension) were also obtained using a visual analogue scale. After the psychological measurements were administered, the physiological measurements were made during the following three periods (5 minutes each, total of 15 minutes). The subject was seated in a chair with eyes closed. b) Stress period (mental arithmetic task): the subject was instructed to subtract 7 serially from 1000.
c) Post stress period: the subject was instructed to relax.